Discussion in 'HYBRID -> EG-EK / DC' started by torturedsol, Nov 24, 2008. Seeing lots of h22 swap questions and misc B.S h22a threads, I decided I'd make a thread here for Honda Swap. An almost complete h22 swap guide if you will. I've done the swap and regret not taking pics of pulling and installing the h22 in my 92 hatch. The usual fluids like oil, coolant, gear oil etc. I'm sure there's other goods needed I'm forgetting at the moment but they shall be mentioned later on. 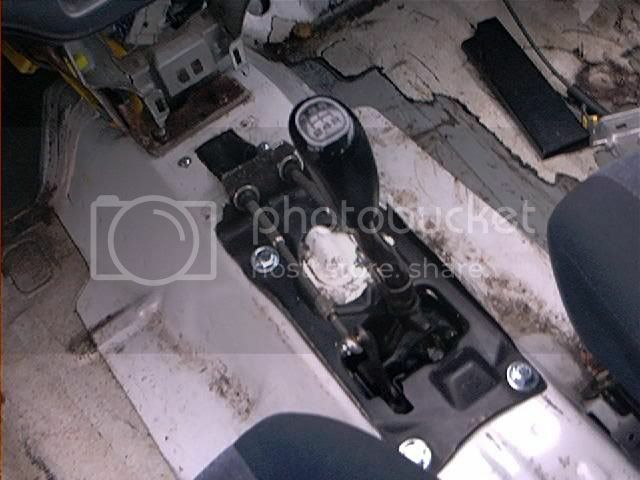 Pull your existing motor, shift linkage and center console. I do not need to do a step by step on how to remove your motor. If you do not know how to do this please close your IE box now. Okay, so now your motor is out. It's time to pull out your sawsall or other cutting device and drill. 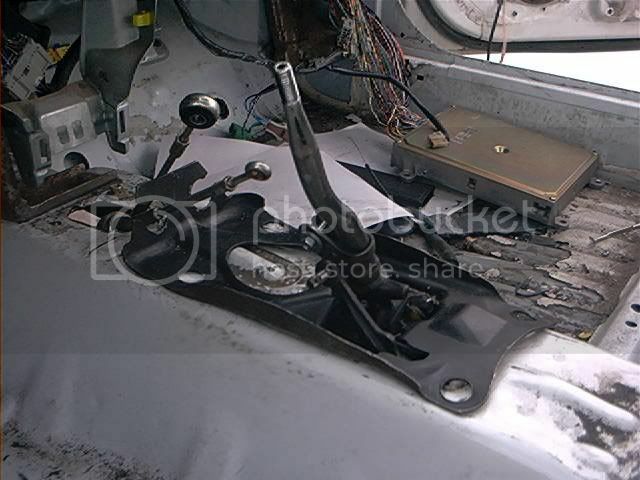 On the passenger side mount you'll see the bigger hole that your d15/16 mount bolt went though. Cut the ears off both sides right where the threaded nut is welded to it. For the smaller hole, we're going to use this as a pilot hole for your new mount. Take your drill with a long drill bit the same diameter as your mounting bolt and drill out the pilot hole on both sides. So you have your fresh H22 sitting there on the ground. Go ahead and put your swap mounts on the motor and the rear mount on the chassis. 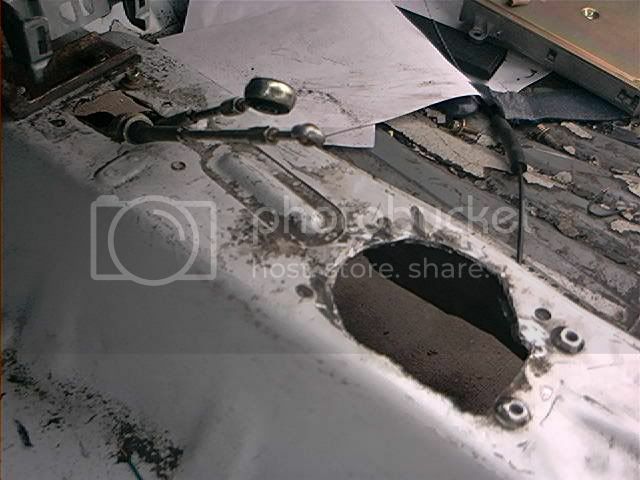 There's a threaded stud on the trans that might need to be cut down to clear the passenger side chassis mount, now would be the time to do that. To reference to, here is a picture of the factory EG OBD1 (92-95 pinouts). For EK information, I highly encourage to post that! - Take off and mark every single harness connector on where it came from/where it goes from both H22A and stock civic engine. Make sure you label them of where pulled the plug from! This will save a TON of time! 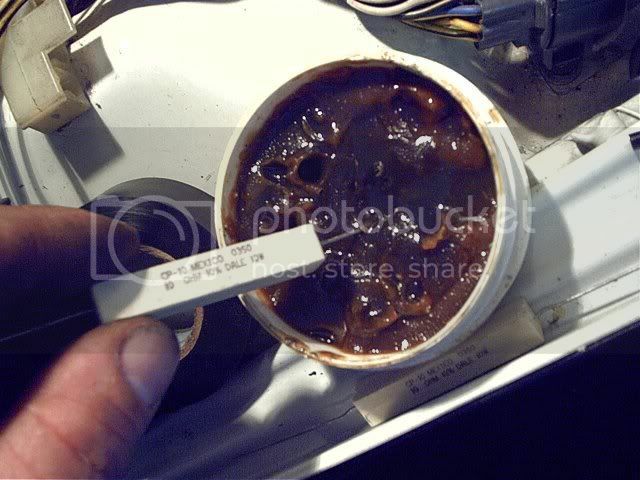 I have taken pictures to clear up more information on the O2 sensor. I will post this tonight. If you have a VX model Civic, if you USE a different engine harness than the factory VX harness (such as an EX/Si, or DX engine harness), you need to perform the VX O2 sensor fix. and moving it to the missing pin mating up with the WHT wire. There will be two available slots at the shock tower harness. You just need to simply salvage a male and female pin from an unused plug, and add the pins to the connector for the factory look. 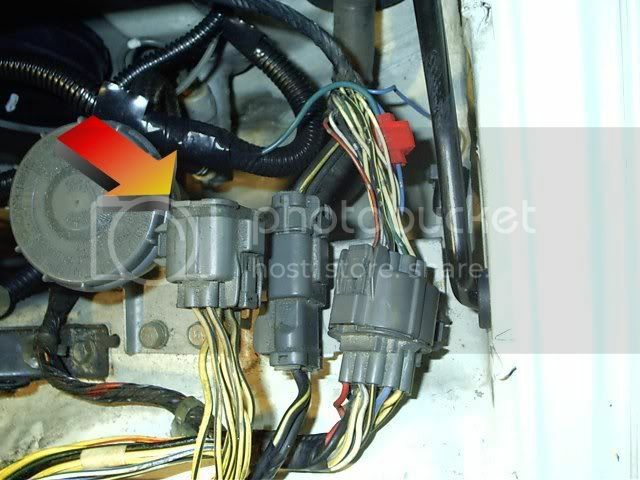 - Add one wire from the VTEC Solenoid (grn/wht wire) to the A4 pinout at the ECU. Add the pin to the shock tower harness, and female pin at the female shock tower connector. 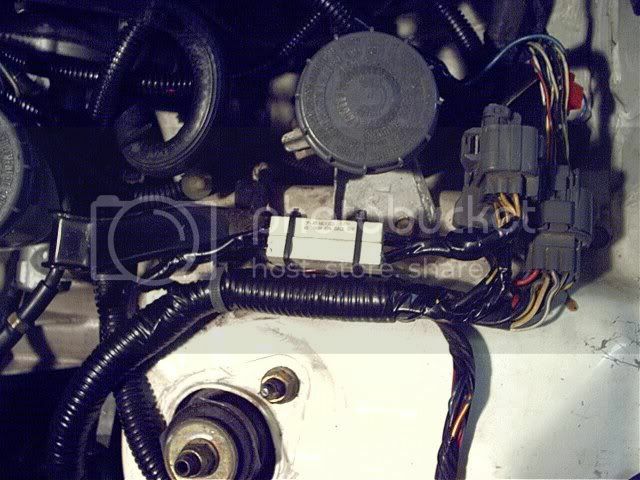 - Add one wire from the VTEC Oil pressure sensor (blk/blu wire) to the D6 pinout, and the other wire which is VTEC oil pressure ground. Simply splice (while soldering!) this to the thermostat ground on the engine harness. VTEC Solenoid -- samething as stated above only goes to the A8 pinout. VTEC Pressure switch -- same thing, going to the C15 pinout. Knock sensor -- same thing, except going to the D6 pinout. IAB Solenoid - A26 pinout and splice with the Yel/Blk junction harness. VTEC Solenoid -- same thing as stated above only goes to the B12 pinout. VTEC Pressure switch -- goes to the C10 pinout. Knock Sensor -- goes to the C3 pinout. IAB Solenoid -- goes to the B16 pinout. Once you have finished your wiring, you're ready to drop the motor in the car. An engine load-leveler makes it easy to drop the motor in the top since part of the trans will sit under the front subframe rail. If you have access to a lift, you can simply lower the car on to the motor/trans. 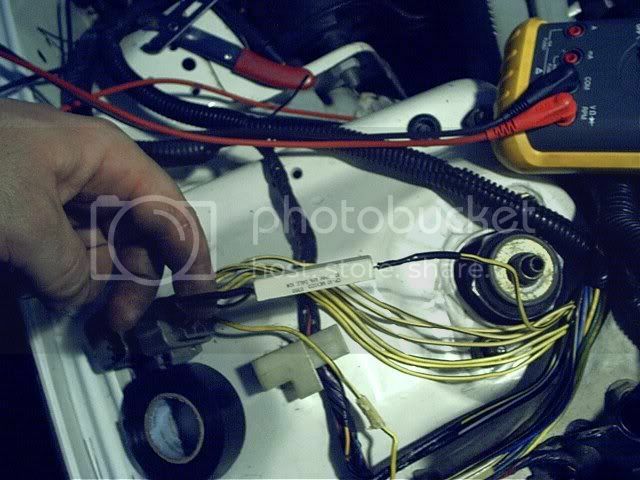 Once the beast is bolted in, you can hook your wiring harness's up and all that good stuff. You may need a new fuel line to feed the rail. Some say the d16 fuel hose is too short. I use one and it worked just fine for me. Hoses you're looking at a upper hose from a 92 Integra LS(my stock d16 upper hose worked fine) and a 94 Del Sol VTEC(b16) lower radiator hose. You'll also notice one of the heater hoses no longer fits like the old d16 hose. Just use a section of bulk heater hose from your local auto store. So now the motor is in, time to install your shifter and cables. You'll want to cut out enough metal at the stock shifter hole location to install your new shifter box from the Prelude/Accord. Next, you'll want to put the hole saw on the drill and drill a hole between the center console and the SRS module to run the cables in to the cabin to your shifter. I think others have used a 1”-1.5” hole saw. I cut a hefty section out of the “trans tunnel” and welded in new metal as it was quicker for me. Go ahead and hook the cables to the shifter at this point and then go under the car for the next part. Take the trans side of the shifter cables and slide them in between the firewall and the rack. On P/S cars it can be tricky but is do-able. The basic setup, also whored from h-t. Almost done! Just need some axles. As mentioned, I used a 94 Accord driver's side mid-shift. Driver's side axle from a 90-93 Integra(trim package doesn't matter, make sure if you have ABS you get the axle with the ABS ring on it). You will have to make a custom passenger side axle. Cut the CV band off the Integra passenger side axle and remove the snout that goes in to the trans. 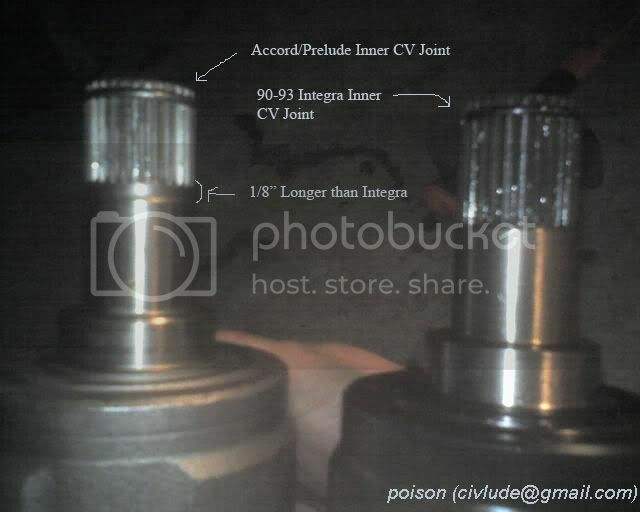 Take your Prelude/Accord CV snout and put it on the Integra axle with some extra grease. Carefully slide the CV boot over the Prelude/Accord inner CV snout and put a new band-clamp on it. There's a few other options as far as axles are concerned. 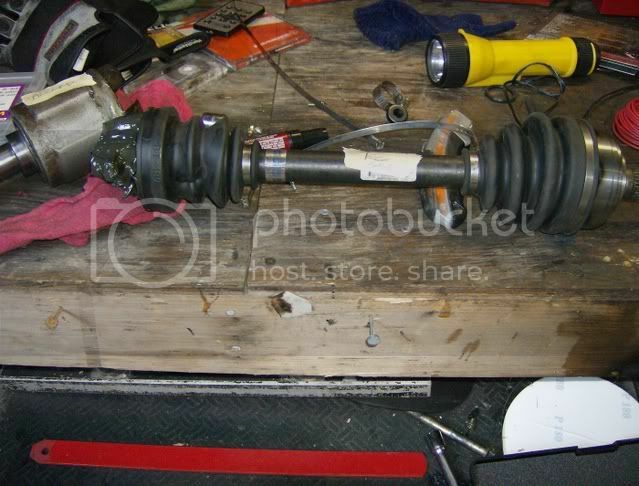 If you have the extra cash I'd suggest a HASport axle kit, or something from RA Axles, Gator, or driveshaftshop.com. Go ahead and fill your trans with gear oil and you're good to go. When all is said and done, it's suggested to beef up your suspension. I've seen some crazy stuff said like the h22 swap weighs like 300lbs more than the stock d15/16 motor. This is untrue! A guy over on Honda-Tech weighed out all 3 motor setups and ,IIRC, there was around a 80lb difference between the b-swap and h22. None the less, it is more weight in the front of the car. I drove my swap around for a while on stock suspension and it wasn't bad. I switched over to a coil-over setup and it now handles like a dream. I run a chipped p28 in my car w/ the swap. I did have a p13 for a while and it ran fine. Only reason I switched to the chipped Ecu was the fact I was too lazy to wire in the EGR valve and the knock sensor(Both of which can be disabled in crome or other tuning software and have no adverse effect on performance). As for your exhaust. It will have to be custom. I haven't found a h22 swap exhaust kit. What I did with mine was cut the header pipe and weld in a new flange to bolt to my existing cat-back exhaust. Any decent exhaust shop should be able to weld in a high-flow cat and hook you up with an exhaust. Any errors found, please let me know so I can change them! 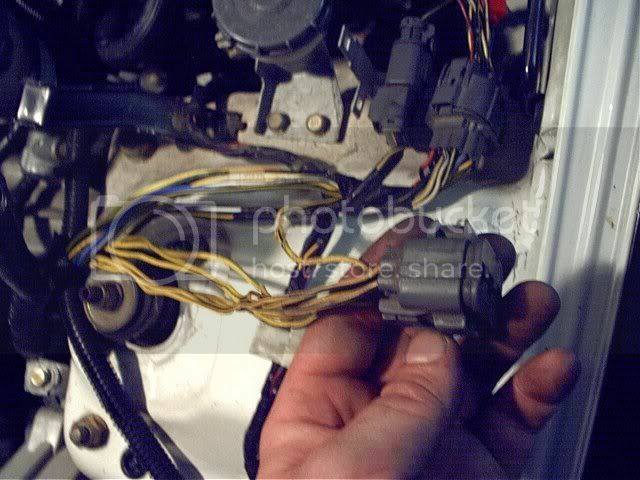 Locate the connector near the left (driver side) strut tower and remove the plug. 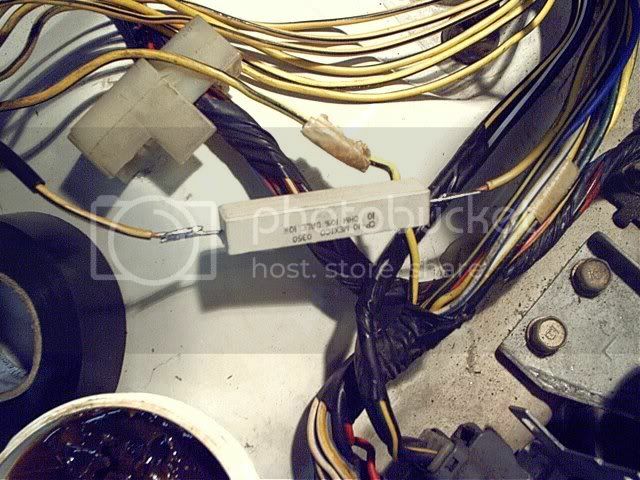 Remove the wire loom and tape to gain acess to the black/yellow wiring. 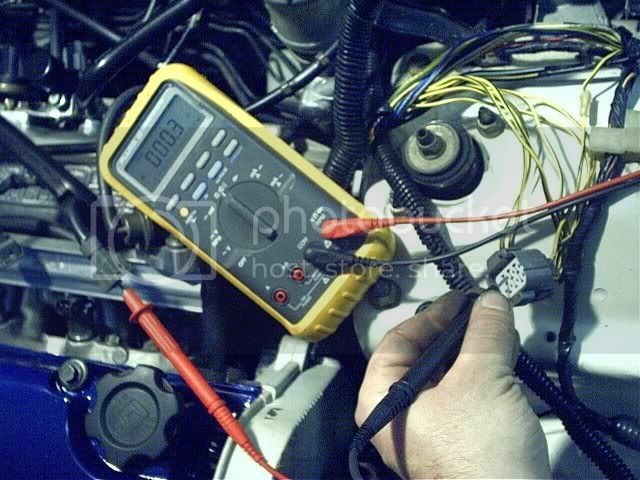 Using a multimeter set to ohms, probe the yellow/black wire in the injector clip and the other end in the strut tower connector. If you use the alarm feature on your meter it will "beep" when you have found the correct wire. If it does not beep then you will see a low ohm reading. Cut the wire and tin it. Tinning is adding solder to the wires to help make a better connection to the resistor we will be installing. I like to dip the ends in flux so the solder sticks to the wires better but you should not have a problem. For a water tight seal and a longer lasting setup I recommend using heat shrink tubing. Place a piece of heat shrink over both ends of the cut wire BEFORE making any final solders to the resistor. Solder each end of the cut wire to the resistor. It is non-directional so it does not matter which way the resistor goes in. Seal up each connection with heatshrink. You did remember to put the heatshrink on before you soldered the wires right? Now repeat each step for each injector wire. Take some zip ties or wire ties to make things a little neater. Tape the wires together and re-install the wire loom. If you want a really nice clean setup pick up a project box from Radio Shack and place the resistors inside and secure it somewhere to the body or the back of the strut tower. Can't belive noone has responded to this, great info man.. great write up, I wish I had this a few months ago when I was swapping my h22a into my del sol. But great stuff! 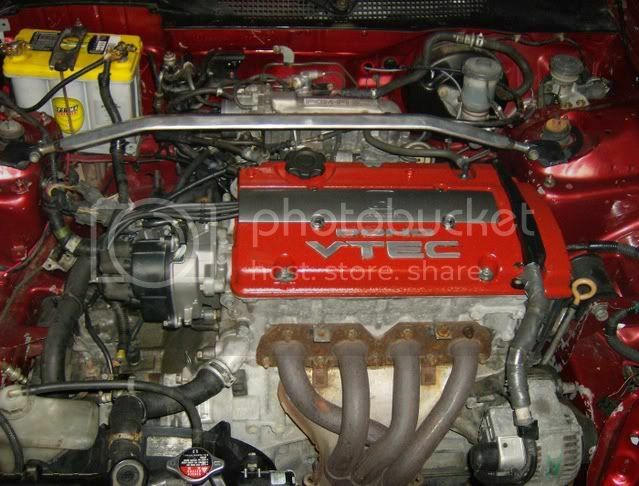 i have a del sol si vtec. 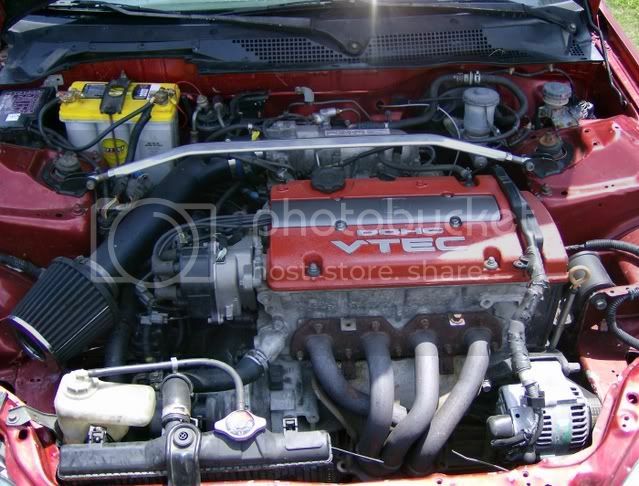 it has a b16 in it so is the swap different for my del sol since it doesnt have the d series engine? you already started your own thread. stop spamming build threads. Great write up!! If i just wanted to take the easy way out an ordered a harness from RYwire i wouldnt have to mess with addin the resistor for the injectors would i? Just send my EG harness and a Lude harness an pay them then be done (Plug an Play)? I just dont want to worry about messing sumthing up!! Great job again!!! After my thicker core civic Radiator took a crap on me I put in a ED radiator and it has held quite well. But, it's winter time and I park my hatch. WV lays waay to much salt and this car has never had honda rot. Since the down time I want to clean it up a bit more. 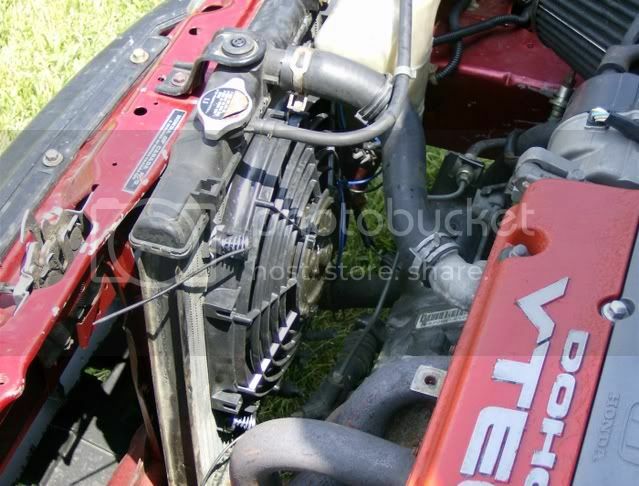 *Go-Autoworks radiator (as they're like $15-$20 more than the ebay "racing radiator") and far better quality... and I don't crap money so the Griffin radiator is out of the question. Use my current slim fan but reverse it and move it to the pusher position. *Semi-tuck. Relocate battery, fuel filter, shock tower connections and a few other things. Also, new paint setup... which is going to be pretty sweet, nothing too over the top but I can't say what it is as I said on d-s.org it's "top seek-rat." If you're a member over there you can get a small clue there... I'll just ask "Have you Flown a Civic Lately?" Would that work for the h22a1 swap? 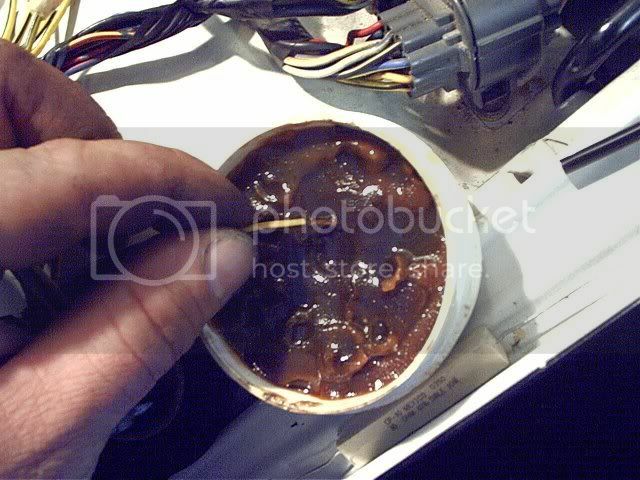 do i have to put resistor on my 1993 civic ex with h22a?